This wonderful house was rebuilt in 2014. It has not only built for architecture lovers, but for travelers looking for the convenience and comfort. The villa is located in a quiet and sunny hillside above the town center in the small village Kotistina. You will enjoy a beautiful view of the city of Makarska and the islands of Hvar and Brac. Surrounded by pine trees and olive trees spend a holiday away from the stresses of everyday life. The delicious organic garden in front of the house holds especially the kids not to take away from a sample. Take advantage of the newly built swimming pool, let the kids in the pool splashing while you enjoy an unforgettable sunset on local delicacies. Nice property. The only issue was that the 4th bedroom was attached but outside and separate to the main house. This maybe an issue for a young family, who intended to use all 4 bedrooms. The views and outside space are great but unfortunately during our stay we were unable to use the outside space much due to the number of wasps. It seems the numbers were abnormal high this year, but the numbers were significantly higher at the apartment than when out. The wasps were not aggressive and no one got stung but we couldn't eat outside and they were constantly around the pool area. The owner was very helpful, although the letting agency were not particularly great with the arrangements for getting to the apartment and gaining access. They communicated with me by email on a number of occasions but then repeatedly sent the booking confirmation and instructions to a different and incorrect email. Overall it was a nice stay but given the sleeping arrangements and the limited use of outside space we really didn't get the full value given what we paid. A wonderful quiet and peaceful place. The villa is absolutely stunning. Tucked onto the mountainside above the town of Makarska with beautiful sea views. It is a very peaceful spot but just a short 5 minute drive into town. We were provided with a very reliable taxi driver by the charming and most helpful owner, Jaksa, who took us into town most evenings. The villa is spotless and very stylish with every detail thought of. The private gym was an added bonus and my boys 13 and 18 loved their badminton tournaments! I wouldn’t hesitate to return to this beautiful location. Excellent modern and smart villa. Friendly and helpful hosts as well. Really excellent choice of villa for our group of 6. Only 10 minutes out of Makarska so easy to access beaches, supermarkets etc. Spectacular views from the external seating areas and pool. Hosts were really helpful with great advice. Will definitely think about a return trip. We are group of 8 girl friends and we have spent fabulous days in Makarska and our Villa. It was very comfortable and lovely, modern furnished and well equipped. And the view?? Fantastic!!! I love to swim in early morning..view was unspeakable. Hosts was so nice and helpful..they give us all needed information about town, night life, good restaurants, excursions, ... ect. After Makarska we went to Dubrovnik but a bit of our hearts stay with Makarska. 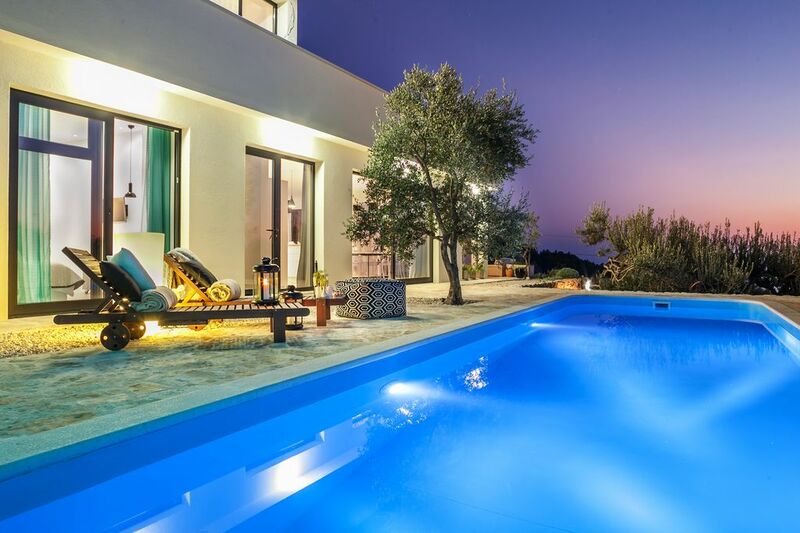 A superb villa with everything that you could need for a perfect family holiday. There is a huge amount of space, all of which is to a very high standard. In addition the outdoor area is fantastic with the pool, perfectly to enjoy the view. Perhaps best of all is the incredibly warm welcome that you receive from the wonderful hosts. It is the best villa we have ever stayed in!